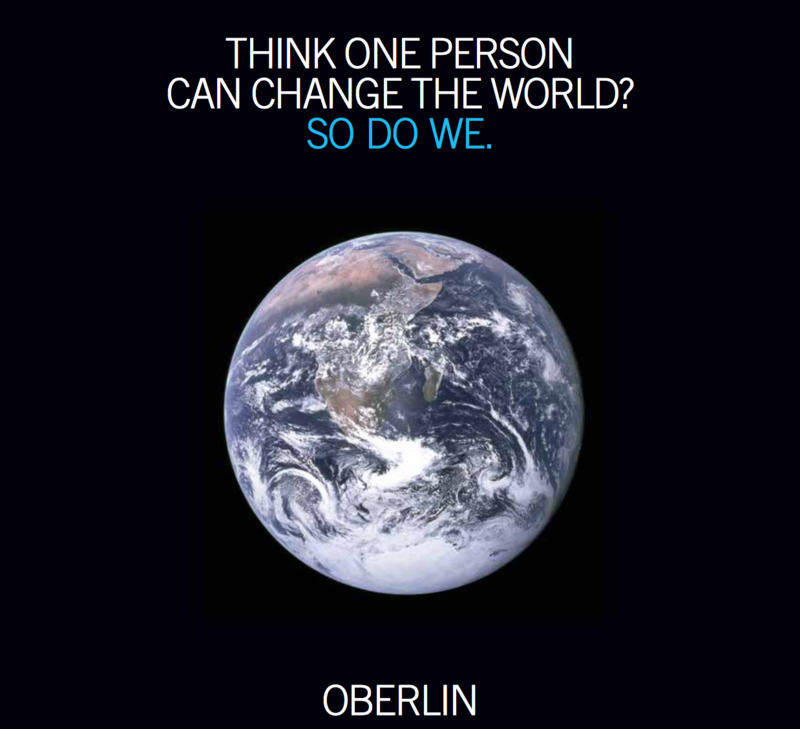 Two of my blogger colleagues have recently offered some perspective on the Oberlin mantra “Think one person can change the world? So do we.” This isn’t the first time I’ve seen folks question if this is the right message Oberlin should broadcast. Many, like El, interrogate the phrase for extremely thoughtful reasons. Some contend that the idea of one person changing the world turns us into isolated figures, islands if you will. Others may find the phrase anxiety-inducing—it’s certainly a lot to ask one person to change the world. While there is a decent amount of criticism of the iconic Oberlin expression to go around, I’d push back a bit on the idea that the phrase subtly moves us to be singular in our efforts for a better world; I’m rather content with it. I love it actually, and I’m doubling down on it. College students like myself are in an incredibly politically charged moment. Turning on the news (when I can actually find a TV) or opening Twitter often leaves me annoyed, upset, or enraged. Each day brings the defamation of a particular social group by public officials. News notifications on my phone alert me to another morally deplorable deportation. That’s not to say nothing good ever happens anymore, the world is filled with incredible acts of kindness and empathy big and small. You’ve got to admit, though, that what’s going on now is particularly tough. It’s in these tough times where I think Oberlin’s message, tried and true, stands strong. Lilah recently inspired me with her quote from Dr. Seuss, so I’m going to throw out another one: “You are not a drop in the ocean. You are the entire ocean in a drop.” I eventually found out this gem was from the poet Rumi, but I first heard it on my journey around the equator last spring on Semester at Sea. There was an obvious nautical connection, but what the quote really brought me back to was the spring of 2015. I was an eager soon-to-be high school graduate. I knew I was going to Oberlin as I had applied EDII. Having experienced the shock and anger that came with the evolving Black Lives Matter movement, I was just beginning to develop a serious sense of social philosophy and a voice to express it. I was also tired. Developing that voice came with consequences, like angry mothers calling to report my tweets to my high school student government advisor and receiving a decent amount of pushback from peers who didn’t see justice through the same frame. People really had a lot of time on their hands, come to think of it. But around that time I was really starting to understand that I wanted to change the world. I needed to change the world. A few years later, I’m realizing that out of all the things I’ve changed during my time at Oberlin, what has changed the most is myself. Back then, I needed inspiration. That’s why I loved that familiar Oberlin poster. Very concisely, the poster explained to me that I was the first step in my process to change the world. Just one person. Me. I sit with that Rumi quote every day. How consolatory is it to know that I, just me, carry the promise of a whole ocean? How fulfilling is it to know that I, me, can change the world? And even better, how beautiful is it to know that there exists an institution who believes in my power to do so? Oberlin has literally left my body sore at times. College is hard. Late nights working on difficult assignments. Running from class to meeting to class to activity to meeting to class. Engaging in complex relationships with others. Working lots of hours for work study. Trying to find a summer job. All of it. But even after experiencing toil, my spirit has always been full at Oberlin. My heart is still intact, filled with love and amity. Now, when I interview prospective students in the Admissions Office, I ask if they could ever see themselves changing the world. I do this not because I expect them to have some grand plan or answer, but to reinforce the fact that I think they can. That someone else thinks they can. That they can. I can’t really read her mind, but I’d be willing to bet that my admissions counselor Kris may have thought something similar of me when I met with her in December 2014. If there’s anything my time at Oberlin has taught me, and there’s certainly been a lot, it’s this: One person’s belief in a better world can eventually lead to a world of change. One person’s belief in another's ability to do good for everyone else, that can change the world.